The Balancing Accessory Starter Kit (BASK) and the Balancing Kit Pro (BK-PRO) were designed for the balancing consultants who never know what balancing challenges they may be called upon to perform. They contain a number of sizes of the common balancing correction weights so you will always have the proper weight for the job. 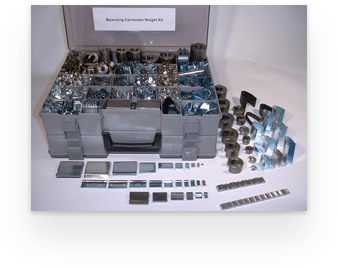 Stainless steel, sheave balancing weights, severe duty weights, extra wide air foil weights or other specialty weights can be added to the kits as needed. All our balancing weights can also be ordered individually in the quantities and sizes required for both initial or restocking orders.